National Women’s Day was established in 1994 to pay homage to the 20 000 pioneering women who marched up to the Union Buildings in Pretoria in 1956. The purpose of the protest was to hand over petitions against the proposed amendments to the Urban Areas Act of 1950, commonly referred to as the "pass laws". In recent years, Women’s Day in South Africa has been marked to celebrate all things women, which makes it the perfect opportunity to do something special. We have put together a list of fun Women's Day celebration ideas – attractions and activities that are just perfect to commemorate the day in style. Whether you are looking for fun things to do for couples or ideas for a girls’ day out – there is something that we are sure you will enjoy. Women’s Day in Cape Town is even better if it involves chocolate – and not just any chocolate. The Lindt Chocolate Studio in Cape Town’s trendy V&A Waterfront Silo District offers a gourmet chocolate experience like no other. Their famous chocolate classes, presented by friendly, informed chocolatiers with a genuine passion for chocolate, uncover the secret world of chocolate in a fun, interactive format. Laced with interesting facts, tips and tricks, the classes involve a bit of play and the chance to learn techniques to work wonders with this heavenly ingredient. Whether you sign up for one of their classes or opt for the indulgent Lindt Chocolate Tasting, this delightful experience is guaranteed to have your taste buds tingling. If you enjoy spending time in nature you will love the scenic Constantia Nek to Kirstenbosch trail. Set in the Cape Floristic Region, the smallest of the six recognised floral kingdoms of the world, the path is known for its renowned fynbos and unique vegetation found nowhere else on earth. A large section of the trail passes through the jade-coloured Newlands Forest where you can admire the beautiful flowers, trees, ferns and bird life, while other elevated sections boast spectacular panoramic views of the vibrant Cape Flats and beyond. When you reach Kirstenbosch Botanical Gardens, why not stop for lunch before returning home? They say that diamonds are a girl’s best friend. This Women’s Day you can dazzle the special lady in your life with a personally guided Shimansky’s Diamond Experience – an exciting tour that unveils the fascinating world of diamonds. You will discover the history of diamonds in the Cape Town Diamond Museum, see replicas of some of the world’s most famous diamonds and watch as rough diamonds are crafted into beautiful faceted gemstones in the Shimansky Diamond Cutting and Polishing Workshop. The highlight of the experience is a visit to the Shimansky Showroom. Here you can marvel at timeless diamond jewellery collections and exquisite engagement rings, including Shimansky’s world-renowned My Girl diamond ring that features a one-of-a-kind patented diamond cut known for its brilliance. An outing that certainly makes for a happy Women’s Day is a visit to one of Cape Town’s most luxurious spas. Envelop yourself in the haven of The Twelve Apostles Hotel and Spa for a day of blissful rejuvenation. Known for its splendid luxury and world-class service this award-winning spa offers a range of treatments designed to revive and restore body, mind and soul. Harmony and tranquillity are the order of the day and guests are spoilt for choice with a range of treatments, which can be booked in their Mountain Spa Gazebo, bringing you even closer to nature. Whether it’s to relieve stress, detoxify, cleanse and purify or simply refresh and rejuvenate, their skilled therapists will make sure you are pampered from head to toe. Their signature experience employs sound healing – the tinkle of a Tibetan Tingsha Bell that marks the end of the treatment, bringing a deep sense of calm and wellbeing. When it comes to ideas for Women’s Day you will be hard-pressed to find a more exceptional experience than having high tea in the elegant five-star Table Bay Hotel lounge. Enjoy the charm of this old tradition while marvelling at views of majestic Table Mountain and the Atlantic Ocean with the gentle sounds of a grand piano tinkling in the background. There are plenty of reasons many regard this as the best high tea venue in Cape Town. The breath-taking views, classic décor and timeless finishes are just a taste of what one can expect. The Table Bay’s high tea is a three-course affair prepared by an award-winning team of chefs. The finest luxury teas from Darjeeling, England and China are served with delicious savoury and sweet treats – from delicately sliced cucumber sandwiches and mushroom and ham quiche to freshly baked scones and chocolate puffs with hazelnut cream. It’s the perfect treat for a special occasion, like Women’s Day in Cape Town. The Mother City has a rich and diverse mixture of culinary styles and cultures, which makes it a paradise for food lovers. What better way to explore all there is to taste, smell and see than with an authentic culinary walking tour? Cape Town Culinary Tours offers a three-and-a-half hour tasting experience where you’ll get to immerse yourself in the Capetonian lifestyle! Exploring the city’s hidden culinary gems by foot, you will engage with local food artisans, learn more about Cape Town's evolving food scene and taste some of its most famous local cuisines – from Cape Malayan dishes to traditional South African Braai food. The delicious tastings are complemented by the sights and sounds of Cape Town’s most vibrant areas, including the iconic Bo-Kaap and De Waterkant to trendy Greenpoint and the bustling V&A Waterfront. 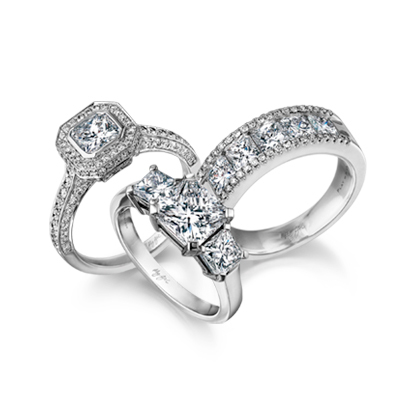 Be sure to request the tour ending off with a visit to The Rockwell where you can gaze upon the Shimansky signature diamond cuts and diamond jewellery designs. After all, every woman deserves a diamond!